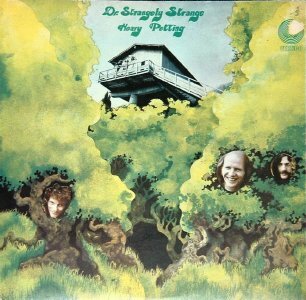 Dr. Strangely Strange are inevitably compared to the The Incredible String Band (ISB) (as well as Comus, Mellow Candle, The Trees and Forest). 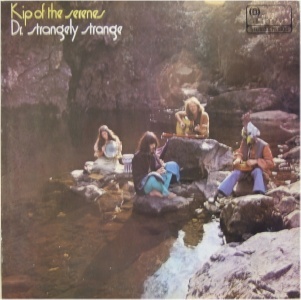 They engaged in the same type of psychedelic acoustic folk music as the ISB on their classic debut LP "Kip of the Serenes", but their second and final LP "Heavy Petting" is quite different. The band was formed in Dublin in 1967 by Tim Booth (vocals and guitar) and Ivan Pawle (bass and keyboards). They became a trio with the addition of keyboardist/multi-instrumentalist Tim Goulding. They began living and rehearsing in a house owned by Goulding's girlfriend, backing vocalist Orphan Annie, which was nicknamed 'The Orphanage', which will be familiar to Thin Lizzy fans. Orphan Annie is also credited with photography on the bands second LP. The were heavily influenced by the ISB with whom they became friends and supported them in Dublin in 1969 (1968?). 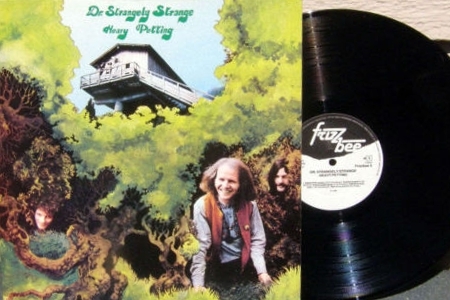 Robin Williamson of the ISB recommended the Strangelys to Joe Boyd and vice versa. Boyd was a potentially sympathetic producer having recorded both the ISB and Fairport Convention. The ISB were signed to his Witchseason management company and he was a producer at Island Records, one of the most progressive labels in England at the time. A demo was sent and Boyd travelled to Carlow to see the band perform (supporting Skid Row). The story goes that he wasn't completely convinced at first and it was only when Bernard Stollman of ESP Records offered the Strangelys a deal (after witnessing a performance in Dublin) that Boyd reconsidered and offered them a deal in 1969. 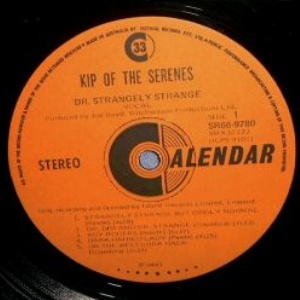 Kip of The Serenes was recorded in London in one and a half days. The credits list a similar array of acoustic folk instruments as found on the ISB recordings, including guitars, whistles, fiddles, harmonium and mandolin. They also shared a similar wide eyed and eccentic enthusiastic hippy vibe. But where the ISB sound rural the Strangelys sound urban, and the ISB are the more accomplished musicians. The Strangely's music was more structured and melodic, and the lyrics carried more literary undercurrents. So they weren't simply ISB copyists and the album is an acid folk classic. 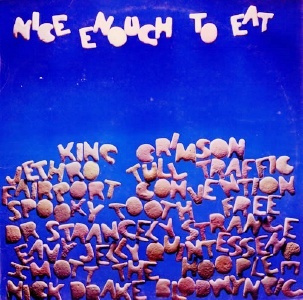 The inclusion of "Strangely Strange But Oddly Normal" on the Nice Enough To Eat budget sampler helped increase the bands exposure and they were extremely busy touring and recording during a two year perid spanning 1969-71. 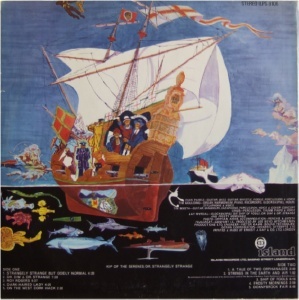 While on tour with Fotheringay, they enlisted drummer Neil Hopwood, and later in November 1969 they guested on the ISB's Changing Horses album. 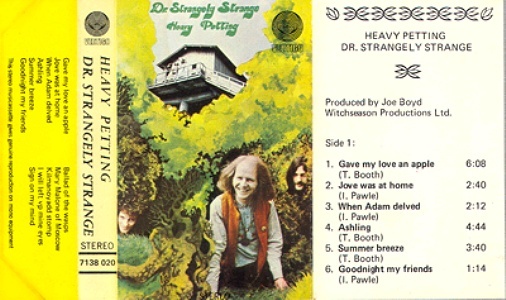 The second album "Heavy Petting" was released on the heavy progressive Vertigo label in the summer of 1970. It's a different kettle of fish, featuring Skid Row's Gary Moore (guitar) and Brush Shiels (bass), Andy Irvine (ex Sweeney's Men, mandolin), Johnny Moynihan (Sweeney's Men, bouzouki), and Dave Mattacks (Fairport Convention, drums). Produced again by Joe Boyd for Witchseasons Productions. While still chaotic and folk-based, it has more of a rock pulse. Tim Goulding left to get married and was replaced in early 1971 by Gay & Terry Woods, late of Steeleye Span. The Strangelys split in May 1971 following a gig at the Theatre Royal, Drury Lane on the 16th. Gay & Terry Woods went on to form The Woods Band. 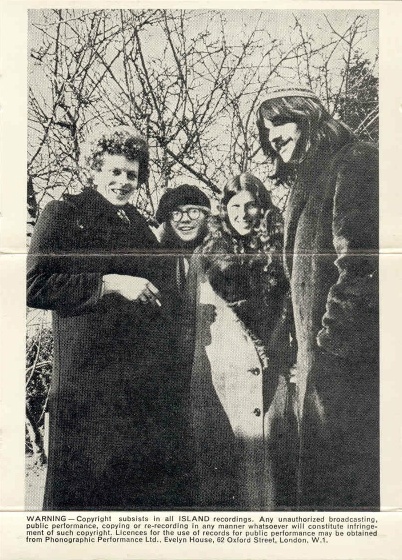 In early 1972 the core trio, who were all living back in Ireland, reunited for a tour of Ireland with a couple of new musicians in tow. 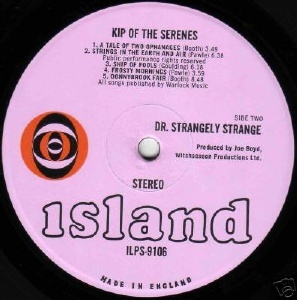 A new Strangelys lineup performed in 1973 with Tim Booth as the only original member in the lineup. They played the free concert at the Pheonix Park in July 1973 (Jonathan Kelly played drums!). The band proper returned in 1997 -- claiming they'd never actually split up -- with a surprise third album "Alternative Medicine" with additional members Joe Thoma (fiddle), Bruno Staehelin (drums) and several guests including Gary Moore (guitar). 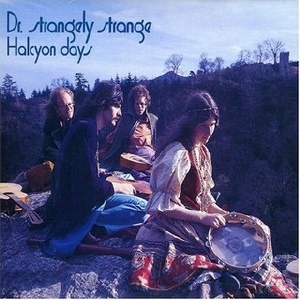 Ten years later, in 2007, a CD of 1969-70 era recordings called "Halcyon Days" was released on Hut Records. This CD includes CD re-recorded tracks and the band members played a number of live shows in June 2007. A couple of low quality live recordings from circa 1970 also surfaced around this time, including a gig at Les Cousins in London. These are very lo-fi and not a good introduction to the band. CD - Island Records - 3D CID 1004 - France - 199? Notes: first Island pressing has the original pink label with orange+black eyeball and outline 'island' text matrix nbrs ILPS 9106 A1 / B1 - stamper codes 11 / 11. 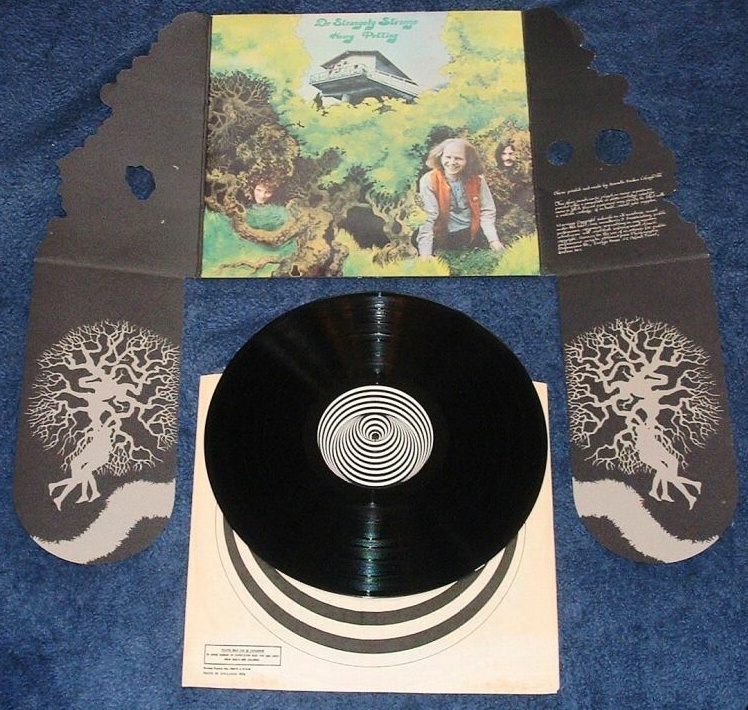 The rear cover of the Australian issue is completely different: a second photo is included and the liner notes of the original pressing are not used. Recorded at Eamonn Andrews Studios & Sound Techniques Studios. The Airmail CD claims to be a 24bit remaster. Notes: Housed in a highly elaborate Roger Dean sleeve. There's a bootleg edition which reproduces the full gimmick sleeve but it's easily identifiable. It feel wrong and it does not stand up to close examination. The cassette edition is resequened to equalize playing time and suffers as a result. The sleeve lists the lineup as: Tim Booth (vocals, guitar, keyboards), Tim Goulding (voc, keyboards), Andy Irvine (mandolin), Johanna (vocals, keyboards), Linus (vocals, percussion), Dave Mattacks (dr), Gary Moore (gtr), Johnny Moynihan (bouzouki), Jan Myrdal (glockenspiel), Ivan Pawle (vocals, bass, keyboards), Brendan Shields (bass), Heather Woods (vocals) and Annie Xmas (vocals, keyboards). 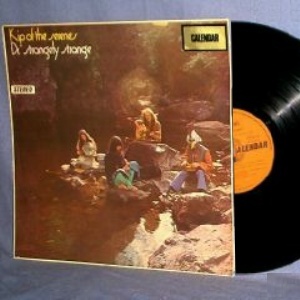 "We are proud to announce news of this previously unreleased album by Dr Strangely Strange, dating from their classic period, 1969/70. Halcyon Days will contain the following archive tracks (mostly produced by Joe Boyd) which were recently discovered in the Island vaults." The originally announced track listing was slightly different, with tracks 10-12 originally described as bonus tracks.